Rabbits have been adored and loved by people for centuries. They are found throughout the world and have a place in children’s books, TV and toys. The Easter Bunny is probably the most famous of all and Bugs Bunny may be a close second. Could an animal which is so widely loved ever cause a problem? Have no doubt about it; rabbits can become a destructive pest around the home. The cottontail and snowshoe or varying hare are distributed throughout the United States. In general, they are able to live in rural as well as urban environments. They reproduce quickly and will fill the landscape with as many rabbits that are able to survive. As their numbers increase, so do predatory animal populations. Fox, cats, dogs, people and coyote are just some of the animals that like to eat rabbit. 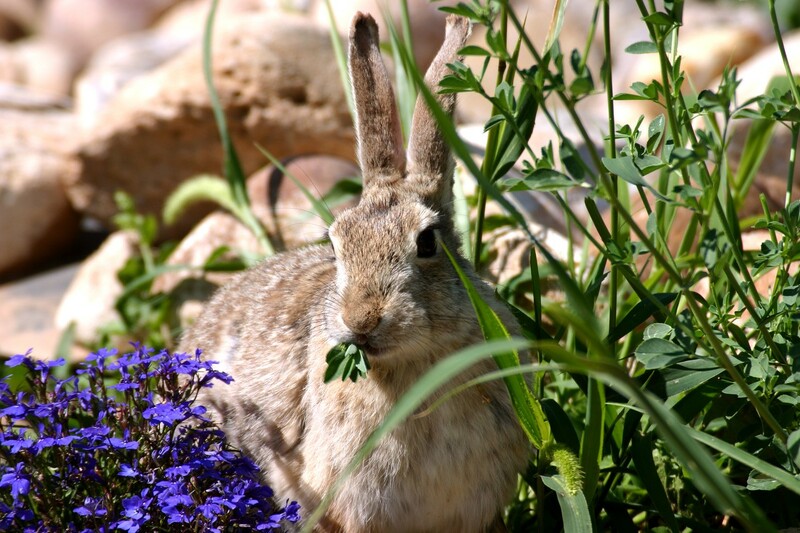 In the wild, these predatory animals are able to help keep rabbit populations in check. Rabbit problems arise when no predators exist. In addition to the native rabbit species, there has been a recent explosion of rabbits which have been released by people who were not prepared for the reproduction capabilities of their pets. These domestic rabbits are being released in the wild on a regular basis. Pet owners are not willing to let their one or two rabbits become 10 or 20 so litters are released in the wild. Unfortunately, the “wild” areas are many times all too close to residential landscape and gardens. Domestic rabbits which are released to fend for themselves are not prepared or designed to “live off the land”. They much prefer processed food and when unable to find any will quickly feed in gardens and flower beds. Rabbits are nocturnal and will feed on just about any plant they are able to reach. Succulent pansies, just about any garden vegetable or fruit and several ground cover species of shrub are all targets for hungry grazing rabbits. Since they strike at night, rabbits may go unnoticed for weeks. Eventually, the gardener may notice plants are simply disappearing or dying. Once in the yard, foraging rabbits will eat grass, flowers and even the bark off trees. A sure sign you have an active rabbit is when you find droppings which are round and small – much like a “cocoa puff” – in the area where you find damage. Other sure signs rabbits are the guilty animal is the damage they do. Rabbits will eat randomly. Instead of ingesting the entire plant, they may only chew the flower or half the plant before moving to the next. This behavior tends to maximize the damage they do and can be frustrating to the gardener. DEER will browse the entire plant down to the dirt and even yank it out of the ground if possible. And though deer can eat more at one sitting, they may only target 1-2 plants and move on where a rabbit might nibble on 5-8 causing a lot more damage overall. There are limited approaches to controlling local rabbit populations. Although they may appear cute when they first appear in your yard, rest assured they are looking for something to eat. Once eating patterns are established, it can be difficult to change. Traditional approaches including wire fences, scarecrow like dolls or predatory animals will not work. Domestic rabbits which have been released in the wild are used to such devices and are not afraid of them. More importantly, these rabbits are large. The average adult is the size of a large cat. Because they are so big, cats will shy away from killing them. And because they are living in true metro and city environments, it is not likely that other predators will be able to help in controlling populations. This means you will have to take action if you want to stop them from destroying your plants and landscape. Rabbit damage in the yard can be minimized by using a repellent. The best repellent will depend on what you’re trying to protect. Setting out predator urine along property borders can keep rabbits from moving into a yard. 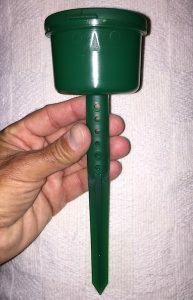 If you have random rogue rabbits coming onto your property and would like to keep them away so they don’t distract a pet or start to nest, place out COYOTE URINE where they might enter. This repellent will naturally repel several small animals since coyote will feed on just about anything they can find. Rats, mice, squirrel, chipmunks and rabbits all seem to be afraid of coyote and when they smell the coyote urine, they are led to believe an active coyote is in the area. It is best to use some in several areas effectively establishing a round zone or barrier through which rabbits will not be able to enter. Use 1-2 oz per 10-20 feet. Placements can be made directly to the ground focusing on main routes of entry. Plan on renewing the urine every 30-60 days. To get longer lasting results when using urine, install GRANULE/LIQUID GUARDS. These hold liquids and will both shield and protect the urine from both the rain and sun. Install Guards along pathways, in flower beds and other areas where rabbits are active. You should still sprinkle some of the material on the ground initially where the rabbits are most active but once they are gone you can use the Guards exclusively. This will let you get the longest residual from urine enabling it to last 60-90 days instead of just one month. Each guard can hold 1.5-2 oz and should be spaced out every 10-20 feet. Drive them into the ground deep enough to be secure but not so deep that you cover up all the holds below the holding tank. This will allow the odor to slowly release. If you desire a more discreet look, install CAPSULE GUARDS. These are small 1/2 oz capsules that hold urine and are then pushed into the ground. Space them out every 2-4 feet and plan on refilling them every 60-90 days. Our kit comes with 12 guards and an eye dropper for easy fill up. One pack is enough to cover up to 50 linear feet. 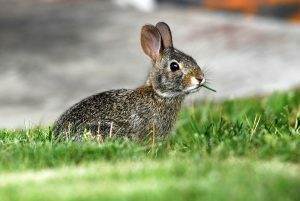 If rabbits are already entering the yard and feeding on grass or plants, use a bad tasting agent to stop the behavior. This approach is designed to put in place a “blanket” of bad taste over the vegetation the rabbits are targeting. 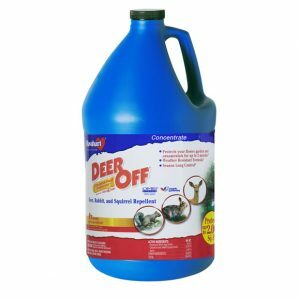 Super concentrated and sure to stop both rabbits and deer, DEER OFF is easy to use and super concentrated. Add 16 oz of concentrate to 1 gallon of water and plan on getting about 2,000 sq/ft of coverage per mixed gallon. Applications will last 2-4 weeks and the mixture can be applied safely to any plant foliage. And don’t let the name mislead you; it will work on Rabbits just as well as it will work deer. Available in both gallons and 2.5 gallon jugs, you get up to 16,000 sq/ft of coverage from the gallon and about a full acre for the 2.5 gallon jug. If you’re looking for a more permanent solution, install our SOUND REPELLER. This device releases “ultra” sound by default but can also send out an audible sound. This unit can be configured to turn on only at night, only at day or anytime. For rabbits, we recommend night time only. This unit can be powered by 4 “c” cell batteries and when powered this way, you can rely on the motion detector setting to turn on the unit when rabbits enter the protected zone. The range of the detector is about 30-40 feet and the device should be set up off the ground about 1 foot. The sound will be effective up to 75-100 feet so one unit can protect up to 5,000 sq/ft of turf. Position units to point out over the turf or garden area needing protection and understand the units are “directional”. This means they are only effective in the direction they face and not behind them. Our units come with a remote control key so you can turn the unit on and off as needed. And the sound will not hurt pets or people so they can be safely deployed around the yard and garden where people are active. They also come with an AC power supply and if possible, powering them on all the time is the “best” setting. This will get the sound over a large area with no relief for intruding animals. They will avoid the sound at all costs so if you can keep the unit running continuously, you’ll get instant results and force the animals to forage elsewhere. For continuous running, set the Operating Time to “Night” and Ultrasonic to “constant”. The Motion Sensor Sensitivity is “N/A” since it will be always on and the Sonic Volume should be turned all the down (to the left) since you will be relying on the ultra sound only. Set the Frequency (yellow knob) almost all the way to the left. If you decide to power the unit with batteries, set the Operating Time to “night”, Ultrasonic to “Motion Sensor”, the Motion Sensor Sensitivity to “30” and the Sonic Volume to “40-60” if possible. The audible sound is quite loud and when the unit goes off, the extra sound will generally help your cause. And after 2 weeks, you can reduce this setting if you need to turn it down due to close proximity of neighbors. The Frequency (yellow knob) should be set almost all the way to the left. Sound repellers are very effective and will last for many years providing a permanent solution to the problem. Wire them into the landscape for a more uniform look and since they only cost $.25-.50 a month to run via the included power supply, a fairly inexpensive fix. A more permanent solution is to remove the invading animal. This can be done with either a live trap or a kill trap. Live trapping rabbit can be tricky but with the right trap and right lure, foraging animals can be tricked and caught. Kill traps are more efficient when you have established points of entry or trails in use. The best rabbit trap size is one that is much larger than the target animal. This will provide plenty of room for the rabbit to enter. 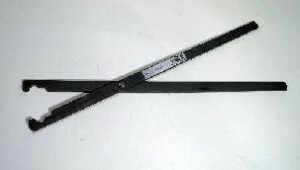 Our LT111230 measures 11″ wide by 12″ tall by 30″ long and is efficient for rabbits. To get fast results, line the bottom of the trap with pine straw or grass so the rabbit will not notice the cage under their paws. Trap sets should be made right at the point where they’re feeding. This could be in a garden, on the lawn or around a specific bush. In some cases covering the trap with sticks and brush will help. This is especially so if the activity is alongside ground cover. Our trap comes standard with a front door only but the rear door model has a sliding removable rear door. This allows for easy sets and quick animal releases as well as access to the trip pan for trap maintenance if needed. 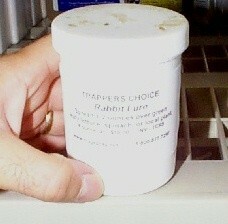 To get the rabbits to notice you’re set quicker and get them inside faster, add TRAPPERS CHOICE RABBIT LURE. This special paste combines several food items rabbits love and has a strong odor rabbits can’t resist. Place a tablespoon of this out over the food lure added to the back of the trap. And wipe out some onto the ground in front of the trap. This will help them locate the entry point of the trap that much faster. If the area where the rabbit is browsing is large, add RABBIT TRAILING SCENT. This highly concentrated lure is designed for use just outside the traps entrance and will effectively increase the area being reached by the scent of the bait inside the trap. Use 1-2 drops applied on the ground at the entrance and then another 1-2 drops every 2 feet in at least two directions. By creating a trail at least 20 feet long in at least two different directions, you will hopefully create a “path” foraging rabbits will follow. By having the scent placed out over a large area, foraging rabbits will undoubtedly smell it even if they miss the trap by a wide margin. Remember, they don’t have great eyes and rely mostly on their sense of smell. By using the Trailing Scent you will be able to lead them in the traps direction. This could be vital for successful trapping since the average rabbit is “smart” enough or curious enough to enter cages in search of food. Unlike raccoon or squirrels, which have a natural curiosity to seek food aggressively and are quite easy to trap, rabbits will many times need a lot of help. Once trapped, you will need to relocate the rabbit at least 5 miles away to insure it will not return. Rabbits don’t migrate well and will take residence at the first place they are able to find a good food supply. Be sure to locate the animal where you know there will be a food supply so that it won’t return to your property. If you have a distinct pathway in use, a kill trap can be a quick way to eliminate the invading animal. These traps rely on a spring mechanism to crush the animal as it enters the trap jaws. For most any rabbit, the BODYGRIP 220. will be large enough for the job. They measure 7″ wide by 7″ tall. Place trap in front of a hole in the fence or over a tunnel their using to get in your yard. They can also be placed in front of a clear path or rabbit trail. Rabbits are creatures of habit and if they’re using a walk way between some logs or bushes, a bodygrip trap set in the middle of the trail will force them to pass through. As they try to fit through the trap, they’ll cause the jaws to close tight and in turn, get crushed. For easy sets, use a BODYGRIP STAND. This stake design is well suited for placing traps in an upright position along trails. Just drive the Stand into the ground making sure it is anchored well. Next, set the 220 over the mount and be sure to place some sticks or brush on either side to ensure the animal stays on the trail. Since the springs on these traps can be hard to set, you may need SETTERS. to help get their springs collapsed. Their springs are quite strong and but setters enable you to get a huge amount of leverage making the job easy. I don’t know what the rabbits are eating I know there’s some flowers but there’s no sign of them eating that. I don’t know what to use as bait. Please help. P.S. I’m using a live trap. Go with the Rabbit Bait we have listed above. It works well. I have a puppy and did fence off the yard and even put a small fence in front of it but the rabbits get in because I see poop. The poop is dangerous for the dog. What can I use or do to get rid the rabbits and not harm the puppy? If you review our article above, you’ll see several options listed that can help resolve this matter. The one I’d try is to live trap it. If you have a fence in place as you describe, the entry point must be a hole or low spot under which the rabbit is crawling. Find this spot and then on the inside, set up a live trap so that as the rabbit enters, it has no choice but to go into the trap. Once removed, use one of the repellents we have listed. To use, apply either the Coyote Urine or the Rabbit Granules along the bottom of the fence. This will effectively keep rabbits from the fence and that will keep them out of your yard. Is the Bat/Rabbit Away Repellent harmful to dogs? I have two dogs that I don’t want to get sick from anything I put down to keep the rabbits out. When used properly around the yard, the Rabbit Away won’t pose a hazard to people or pets. In fact, pets will usually just acknowledge the product is there and then forget about it within a minute or two. But if you want something you won’t even be able to see, go with with the spray. It too has a slight odor but it works very well, will cover a larger area and can’t be seen after you apply it and the spray dries. Lastly, placing out some Coyote Urine around the boundaries of your property to create an “invisible fence” will also help quite a bit. I volunteer for our local little league and I am thinking the rabbits are chewing holes around the bottom of my batting cages. Have you heard of rabbits chewing through rope or netting and is your product safe around kids. Is the odor noticeable to humans? Rabbits will not commonly chew through man made materials like rope or netting. But there are several small animals that do. The most common reported is squirrels followed by rats and mice. In some cases these animals are chewing as a way to grind or sharpen their teeth. In other cases, they’re trying to extract a nutrient from the material. This can sometimes be related to a chemical treatment the rope or netting has received. The good news is you can stop this chewing by applying some Ropel or Pest Rid to the areas they’re targeting. Neither repellent will pose a hazard to the kids or local wildlife. Basically these agents don’t taste good and where applied, animals will avoid. The Ropel is odorless and treatments should last 2-4 weeks. The Pest Rid is a bit stronger and will have a slight odor when first applied but within a few hours, this will dissipate and not be noticeable. The urine granules aren’t nearly as strong as the real urine we sell. Our urine is all natural, pure and not processed in any way. And when used in our Liquid Guards, applications will last 1-3 months so its way more cost effective. We also recommend putting up a net barrier around the plants. There are two options: a solid strong plastic type “screen” that can be stood up and held in place with tomato stakes. It usually takes just 2-3 stakes to hold it up. We also have plastic “netting” that can be draped over the plant. Personally I prefer to use the Screening since it’s stronger and sits around the plants but some people like the netting. One other reason I like the screening is because you can spray some of the liquid Coyote Urine over it to get extra repellency action. Use both for maximum protection. My sister lives outside of Las Cruces, NM and is pulling her hair out with all the plants and money wasted to the rabbits. She’s tried planting supposedly rabbit-proof species of bushes and flowers. Nope. Apparently those rabbits didn’t get the memo. She’s not a gun person so won’t entertain the idea of shooting them. The latest attempt is to put out vegetable edibles that would normally be thrown in the garbage, thinking that they might draw the rabbits away from their plants because they’ll be busy eating what’s given to them. She’ll probably just end up attracting even more rabbits. My suggestion was to put out leftover meat and bones, well away from the house, to attract a coyote. Problem solved, maybe? But I’ll send her the link to your site and recommend she try your Coyote Urine. Putting out more food will no doubt make the problem worse. I know because in every case where people have either put out food to “help” under nourished animals or where they’ve done so attempting to distract the animals from other food in the yard, it never works. Once the local population learns of food readily available in her yard, they will come with heightened expectations. And that will lead to more animals with more appetites. At some point the demand for food will overwhelm her and what she offers will fall short of what they expect. This in turn will lead them no choice but to feast on her plants. Alternatively she can make the landscape “scary” to them by setting out Ultra Sound devices and Coyote Urine. The sound devices should be configured to “constantly on” meaning they’re sending out sound waves all day and night. The urine should be applied “around” any plant she wants to protect by applying it directly to the ground. She should also use it as a “barrier” by placing it along borderlines she knows they’re using to enter her yard. Thanks for your reply. Yes, I’ll definitely be giving her your website and your comments. But what did you think of my idea to try to attract a coyote to the area. She’s well outside of town and she doesn’t have any small pets that roam outside that would be tempting to coyotes. Would you consider that dangerous? Having lived in rural parts with plenty of coyotes around, though rarely seen, I never had a rabbit problem. Now do you need to use both lure and urine? Probably not. Especially since you don’t want to trap them. But if she sets out coyote urine around her property, it will definitely get the attention of any coyotes in the local area and they’ll naturally want to come around to see what all the “scenting” is about. This will in turn “enhance” the natural repellency of urine to rabbits because the only thing worse to them besides coyote urine is an actual coyote! As for it being “dangerous” to have coyotes around? No doubt any canine can bite and if she has some coming around and then tries to befriend them or handle them in some way, she’d be making a big mistake. But there is little or no risk of her getting bit if some are active around her property “naturally”. In general, they don’t like people and will avoid us big time. Thanks for your thoughts on the coyote attraction idea. And also for cluing me in on using urine to attract them. Didn’t know that. What my idea was is to leave leftover meat and bones around the property (but away from the house). I figured the smell would attract a coyote. But I’ll let her know about using urine instead, and ordering it from you. Definitely avoid leaving meat around the yard. It could attract bad insects as well as unwanted animals like cats, dogs, raccoons, rats, snakes or lizards just to name a few. And though coyotes won’t pass up carrion if found when naturally foraging, they don’t generally go out of their way to find it in new regions. Any of the repellants able to be used with three small yorkies in the yard? They eat rabbit poop and it has made hem sick. All of the repellents listed above can be used in the yard safely where people and pets are active. For your situation, I suggest the sound repellers. If you place them along property lines pointed in the direction where rabbits are entering, they’ll hear the sound and stay out. Units can be remotely turned off/on so if desired, you can put them in standby mode when the dogs are out but the sound will not “hurt” them in any way. Dogs will hear it, check them out and within minutes forget about them. My dog doesn’t even look twice at them anymore. This will happen with animals native to the property so your Yorkies will be fine whether you power the units via battery only or with the included power supply.